Greater consumer demand for high-quality, safe and traceable products, a constantly changing market, price volatility, fierce competition, increasingly complex regulations, higher fuel costs, and difficulties in obtaining financing are just some of the issues faced by companies in this industry. Agri-food businesses are required to manage a large number of variables and to maintain a delicate balance within their industry. 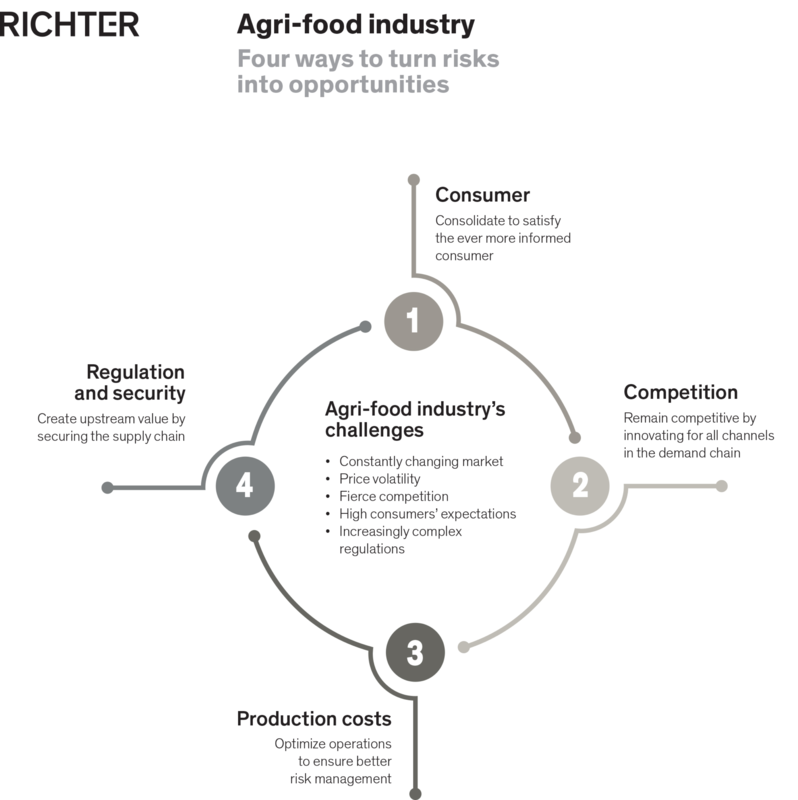 John Charalampopoulos, partner with Richter and specializing in advisory services for the food sector, has outlined the four principal risks facing agri-food businesses as well as tips to turn these risks into opportunities. Today’s consumers are well-informed, demanding people of action who make clear choices in keeping with a set of values. They tend more and more towards healthy foods produced using humane and environmentally friendly methods. This contributes to rising production costs for agri-food businesses, which have two options: increase prices or try to achieve economies of scale through consolidation. Although many consumers are willing to pay more for a high-quality, environmentally friendly and traceable product, agri-food businesses are increasingly opting for consolidation, which often provides better support in setting up market channels, managing operations more efficiently and optimizing the supply chain. The many—and growing number of—quality control regulations also drive production costs higher for industry players, although they do provide benefits as well. By reducing safety risks upstream, companies are not only able to save both time and money (thereby avoiding lawsuits and public relations issues), but can also achieve more efficient management since there is a safe supply chain as well as an obligation to enforce discipline and to structure and document various operations—from the farm to the dinner table—meaning that companies are better prepared to manage risks. Maintaining a company’s profit margin in the agri-food industry, a highly competitive and rapidly fluctuating market, requires appropriate and proactive risk management. To achieve this objective, it is recommended to develop best management practices for the value chain and the supply chain, thereby encouraging flexibility, a reactive approach and adaptability, which are crucial to the survival of businesses in this sector. Companies can therefore protect themselves against expected increases in operating costs, which include both discretionary costs (R&D, capital expenditures, advertising) and non-discretionary costs (e.g., exchange rate, energy costs, transportation, labour and raw material costs). Achieving success in the agri-food industry also requires being able to adopt innovative new approaches for products, activities and customer relationships. As Mr. Charalampopoulos explains, “agri-food businesses must invest in R&D in order to innovate with a view to becoming more competitive and maximizing growth”. The emphasis should also be on putting in place new sales and marketing channels as well as using innovative platforms for communicating with consumers, e.g., using information technology and social networks. To prosper, agri-food businesses must deal with the urgent need to manage the risks inherent in their industry. Regardless whether improved operating efficiency is achieved by optimizing their supply chain, through consolidation or by developing innovative new production and marketing strategies, they must seize all of the opportunities available to them to make the most of this changing environment. This article was originally published in Action Canada-France magazine.